Hey Y’all! Even though we’re still a week away from Thanksgiving, I’ve already started my Christmas crafting! Normally I don’t even want to think about doing anything Christmas related until the first week of December but this year I’m like, well, a kid on Christmas! We bought our house last December and rushed to be in the week before Christmas. I threw up a few decorations and that was it. It was such a chaotic time, I wasn’t in an overly festive mood. This year, I’m making up for it! I’ll be doing a Christmas home tour sometime in the coming weeks so you’ll get to see everything then, but, in the meantime, here’s a little something I’ve been working on! For the past few years, I’ve incorporated musical touches in my holiday decorating. I wanted to add a little more depth to it this year so I’m mixing in some book pages as well, along with reindeer and plaid! It’s huge this year so I haven’t had a hard time finding things to add to my decorating arsenal. My friend Kelly and I got on a pillow making kick. 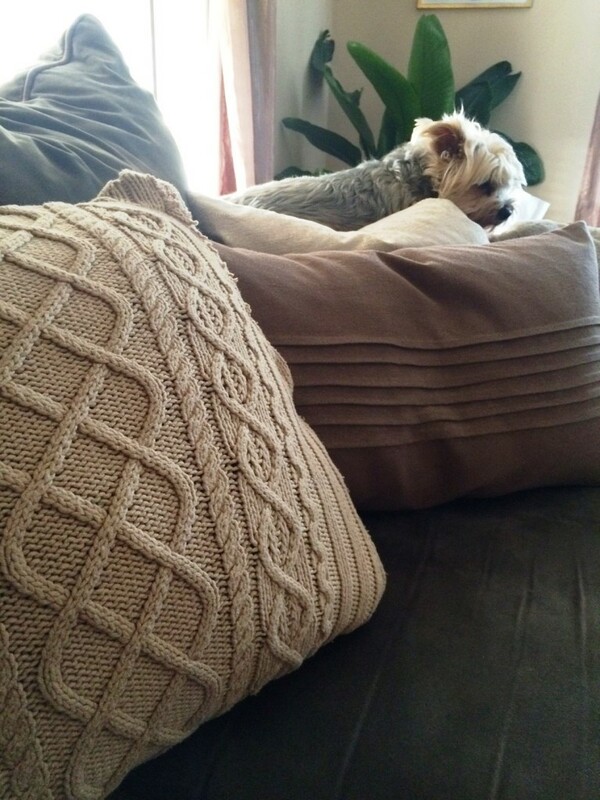 We found ourselves wishing we hadn’t gotten rid of those old cable knit sweaters because popping up all over Pinterest were these adorable sweater pillows. We both managed to find one or two laying around our homes but we needed more. I usually have an aversion to thrift stores. Snobby, I know, but something about them just gives me the heebie jeebies. They all have the same smell and it makes me itchy. I managed to conquer that fear when I realized that it’d be a perfect place to score old sweaters for a bargain. Kelly headed over to Savers that weekend where they had an additional 50% off the store. 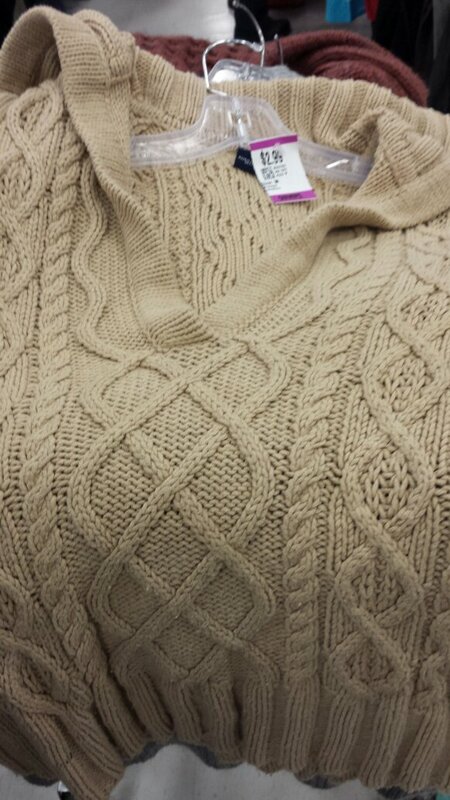 She found an awesome beige cable knit sweater for me for only $1.50!! It was a really nice GAP sweater but it was just a little dated. I almost felt bad cutting it up. Almost. Then I saw how cute my pillow came out. I am by no means a sewer, in fact, Jamie just had to teach me. There’s something to be said about public schools and home ec classes. In Catholic school, we swapped sewing for bible study but we were very good at rolling our skirts to make them appear shorter. Sew anyway (see what I did there?! ), my husband taught me to do a quick stitch. He’s so handy to have around. 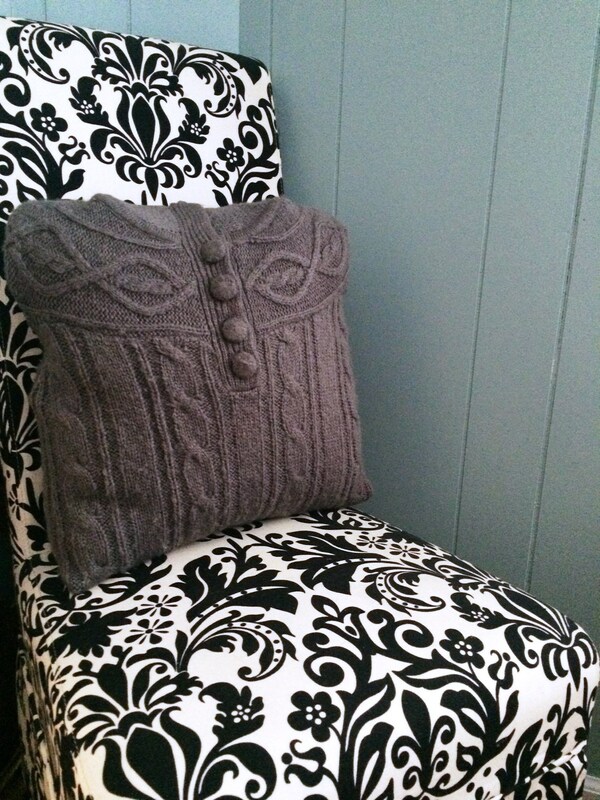 I made the beige one for the living room and the grey one for the dining room chair. Oh, but I was’t done there. I need to bring in some plaid and reindeer! I picked up this feather filled oatmeal pillow at IKEA for $5(ish) and half a yard of fabric at Joann for $3. 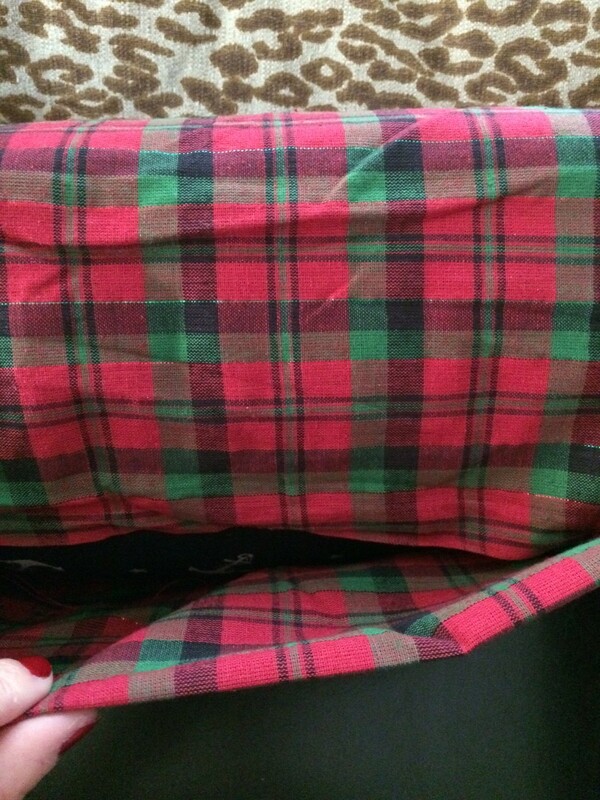 I took an old pillow I already had and made a cover for it. I made it like an envelope closure so I could easily pop the pillow out. Then I used the leftover fabric and cut out a reindeer based on one I’d printed. 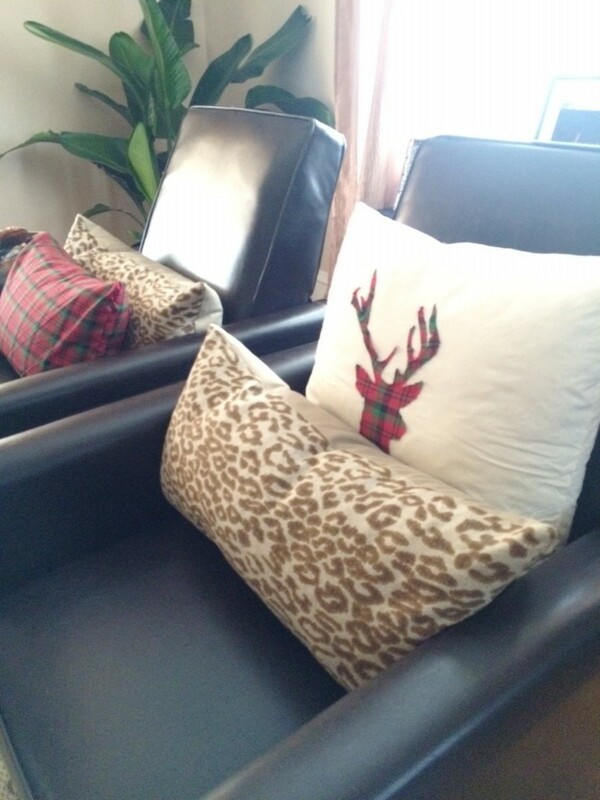 I then used some heat and bond and applied it to the back of the reindeer, then ironed it onto the pillow. 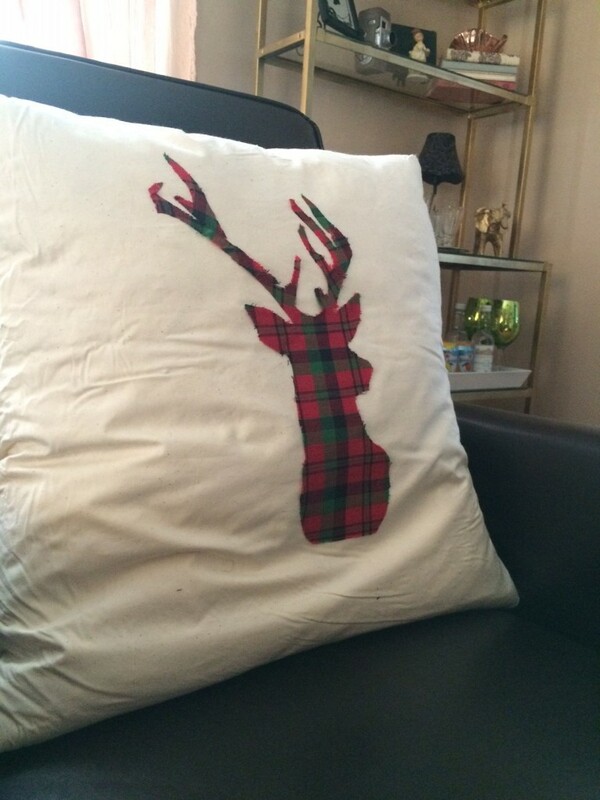 In hindsight, I would have put a square of the bonder on the reindeer and then cut around it after it had adhered to the fabric, but before ironing onto the pillow. Instead, I cut strips and applied it to the reindeer that way. I found where it overlapped the edges, the frayed fabric was sealed a little and trimming the excess off made it look cleaner. If you do go that route, make sure you don’t mind getting your ironing board cover a little messy with bond and be prepared to pull it up quickly. 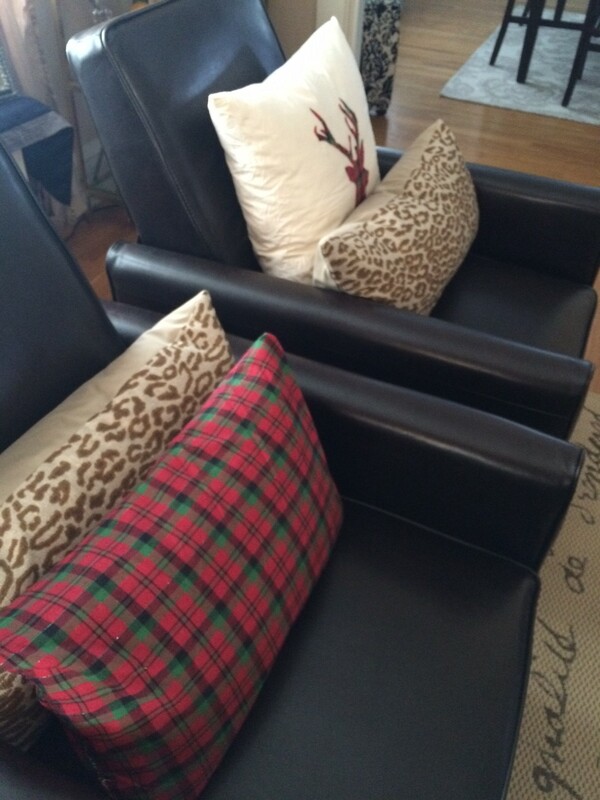 I added my plaid accent pillows to my current leopard ones and I’m really kind of digging it. Apparently, plaid and leopard is a thing…according to Pinterest anyway, and I am not complaining. What do you think of mixing the two prints? I apologize for these crappy pictures. I snapped them in a rush on my phone. Follow me on Instagram to see sneak peeks of some other Christmas crafting I’ve been up to! Next Post Styling Harvard: Etsy Shop Sale!